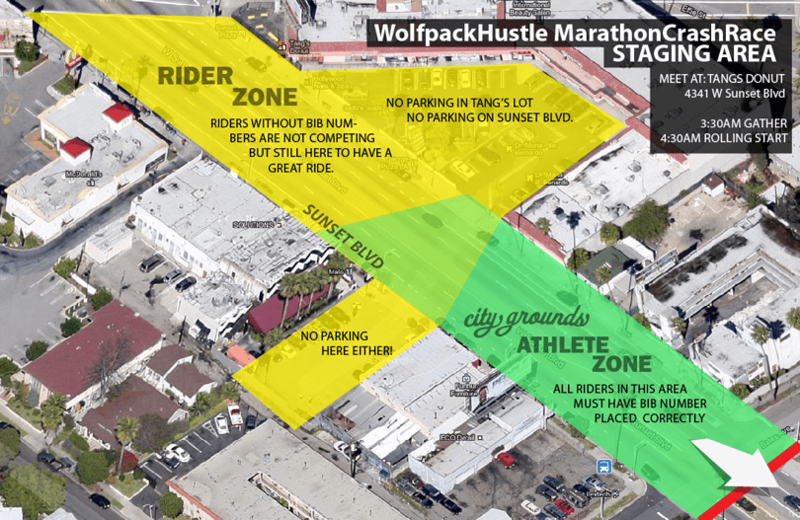 Wolfpack Hustle Prepares to Crash the L.A. Marathon This Sunday! Wolfpack “Dog Tags” are the most sought after street cred in the Los Angeles underground bicycle-racing scene. There is no second place. It’s first Men’s/Women’s geared and fixed gear bikes across the finish line. Do you think you have what it takes? Wolfpack Hustle is a weekly bicycle ride that has been meeting every Monday night at Tang’s Donuts on Sunset & Fountain since 2005. In the beginning, Wolfpack Hustle initiated a period of empowerment where LA cyclists were discovering they could ride 30 plus miles at a fast pace all over LA’s vast 6000 mile stretch of streets. Each week, a new adventure, every cyclist pushing the limits of his/her capabilities for the FUN of it. From Wolfpack Hustle birthed fast rides popping up all over LA: Cub Camp, GOGA, Bicykillers, SIRENS, Gorilla Smash Squad, Root Run and so on. Wolfpack Hustle is an ongoing tradition that has evolved to bringing a balance of institution and safety to its cyclists, still holding true, though, that only the fastest can hang. So, you can cycle fast through the streets of LA? You can hang on the wheel of the rida in front of you? You can pull a string of racers hungry to play every week, every Monday night? Well, In 2007, Don “Roadblock” Ward took Wolfpack Hustle’s Monday night adrenaline rush to the next level with the 2nd Street Tunnel Drag Race. Where LA cyclists dragged against the best of the best. Not permitted. Not Sanctioned. Winners taking home the first ever Wolfpack Dog Tags! In the same year, Wolfpack brought the drag race to the 6th Street Bridge and, again, LA underground racers went head to head for the tags. While Los Angelinos slept in their beds, the chaotic perfection of the bike wheel across the finish line propelled LA’s guerilla race scene into its third race concept: The All City Team Race. From Tang’s on the East side of LA to Dockweiler Beach. Teams of five, one fixed gear, in the rush of the hot summer Sunday afternoon fought their way through 18 miles of LA traffic to the finish line. In 2010, Wolfpack Hustle produced its first ever Marathon Crash Race at 4am to enjoy racing their bikes along the 26 miles of car free streets. Promoted heavily on midnightridazz.com, 400 cyclists showed up… In the rain. “The idea for the Crash Race was a bit of a protest because they got rid of the ACURA Bike Tour when the route changed from a circular one to an east to the beach format. It was as though the Marathon officials didn’t think cyclists could find their way back to the east side.” Don “Roadblock” Ward says. And with this protest, the underground race scene added a new chapter giving hungry LA bicycle-racers another chance to take home the Dog Tags. For 2013, Don “Roadblock” Ward, backed by CHROME, Red Bull, Aventon Bikes, City Grounds, and Bicycle Attorney, Thomas Forsyth, has upped the anti introducing “The 2013 Wolfpack Hustle Unified Race Series” beginning with the first race in this triple threat year this Sunday at 4am: The Marathon Crash Race. Next on the list is the Downtown LA Criterium in June followed by the Drag Race on the 6th Street Bridge in September. Dog Tags will be awarded to those who cross the finish line first for each race, but a point system will be implemented as only one Man and one Woman will be given “The Unified Title” after racing all three! For more information on The 2013 Unified Race Series, please visit wolfpackhustle.com. This year, The Wolfpack Crash Race has more organization, a police presence to help keep the racers safe and a better division between cyclists who are there just to ride and the serious racers vying for the tags. Over 2000 Roadies, Fixie Foos, Midnight Ridazz and cyclists from all over LA and the U.S. who love the adrenaline rush of racing have registered and have been preparing for months, some confident enough to just show up. Why not? These are their streets. Whose streets? Their Streets! Their streets with the want for speed. You know, that hunger feeding the addiction to take their two wheels to the streets with no fear, nothing but rubber against pavement, that burn to beat the cyclist in front of them, the fire in the pit of their stomachs as they gasp for oxygen to excel them closer to the dog tags, to ultimately challenge themselves beyond what they ever thought they could be capable of…. the morning is here, see you Sunday, March 17th, 4am at Tangs! Editor’s Note: Please welcome Sara Bond as the newest writer to join the Streetsblog family. A published poet, Sara went to the University of the Arts in Philadelphia for Writing for Film & Television, and has been car-free and biking LA for 6 years. She is currently working on her first novel. You can read her blog at thesarabond.blogspot.com, and see her poetry book here. Happy to see the Wolfpack maturing and emphasizing safety and outreach instead of some nebulous, ridiculously juvenile notion of ‘street cred’. As a daily bike commuter my run-ins with both critical mass and wolfpack ‘ridas’ hasn’t always been friendly (I’m a safety stickler and an ‘old man’ and believe in outreach – not competition). I have been sensing an attitude shift of late however while noticing more helmets, more obeyance of traffic laws and less youthful arrogance in the riders I’ve met on my commute. Keep up the good work Don! When will this ride take place again? This looks so fun I got a bike from https://www.calibicycles.com and I would love to join something like this.